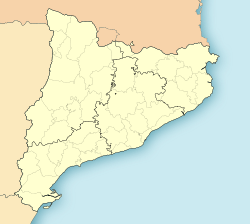 Calaf (Catalan pronunciation: [kəˈlaf]) is the main toun in the northren portion o the comarca o the Anoia in Catalonie, Spain, situatit on the Calaf Plain. The toun haulds a important weekly livestock mercat. It is servit bi the main N-II road frae Barcelona tae Lleida, the RENFE railwey line frae Manresa tae Lleida an the C-1412 road frae Igualada tae Ponts. Calaf haes a exit frae the new C25 that crosses Catalonie frae Girona tae Lleida an aw. The remains o Calaf castle dominate the toun frae a hilltop. The veelage o La Pineda (population (2005): 195) is includit athin the municipality o Calaf. Wikimedia Commons haes media relatit tae Calaf. This page wis last eeditit on 11 Mairch 2018, at 10:25.